In contrast to ET, Coordinated Universal Time, UTC, uses the TAI second as the fundamental unit, but introduces 1-second steps occasionally to make UTC follow -the nonuniform rotation of the Earth. UTC is necessary for terrestrial navigation and surveying for which the rotational position of the Earth at a given instant is critical. It is this time which is broadcast internationally and is used for tagging spacecraft data and for all civil timekeeping. Finally, sidereal time is a direct measure of the rotational orientation of the Earth relative to the "fixed" stars and, therefore, is used to estimate the position of a spacecraft relative to points on the Earth's surface. The characteristics of the various time systems are summarized in Table J-l.
after only 1 year, several orders of magnitude worse than what is acceptable for many unsophisticated measurements. Thus, the generation of accurate ephemerides requires a precise time measurement system. The diurnal motion of celestial objects is the most obvious timekeeper. Until the Middle Ages "seasonal hours," one-twelfth of daylight or nightime periods, was used. Of course, this unit varies both with the season and with the observer's latitude. A more uniform unit of time is the apparent solar day, defined as the interval between two successive passages of the Sun across the observer's meridian. As discussed below, this interval varies throughout the year due to variations in the Earth's orbital speed and the inclination of the ecliptic. 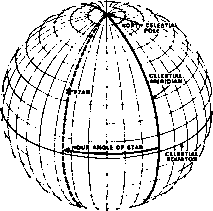 The Earth's orbital motion does not affect the sidereal day, the interval between two succesive meridian passages of a fixed star. However, irregularities in the rotation of the Earth cause both periodic and secular variations in the lengths of the sidereal and solar days. The first satisfactory alternative to celestial observations for the measurement of time was the pendulum clock. The period of a pendulum is a function of the effective acceleration of gravity, which varies with geography and the position of the Sun and the Moon. The resonance frequency of quartz crystals has recently been employed in clocks; this frequency depends on the dimensions and cut of the crystal and its age, temperature, and ambient pressure. Atomic clocks are based on the frequency of microwave, emission from certain atoms. An accuracy of 10"14 (fractional standard deviation) may be achieved with atomic clocks; corresponding accuracies for quartz and pendulum clocks are 2X10"13 and 10~6, respectively. 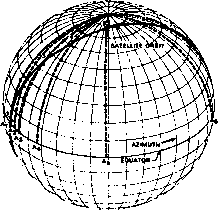 For an extended discussion of time systems, see Woolard and Clemence , the Explanatory Supplement to the Astronomical Ephemeris and the American Ephemeris and Nautical Almanac [H.M. Nautical Almanac Office, 1961] and Miller and Jappel . Solar Time. The celestial meridian is the great circle passing through the celestial poles and the observer's zenith. As shown in Fig. 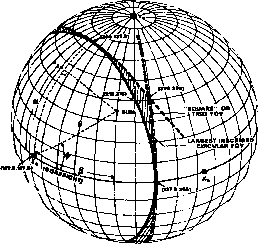 J-l, the hour angle, HA, is the azimuthal orientation of an object measured westward from the celestial meridian. As the Earth rotates eastward, a celestial object appears to move westward and its HA increases with time. It takes 24 hours for an object to move completely around the celestial sphere or 1 hour to move 15 deg in HA; thus, 1 deg of HA corresponds to 4 minutes of time. The apparent solar time is equal to the local HA of the Sun, expressed in hours, plus 12 hours. Apparent solar time can be measured with a simple sundial constructed by driving a long nail perpendicularly through a flat piece of wood. If the nail is then pointed toward the celestial pole, the plane of the wood is parallel to the equatorial plane, and the shadow of the nail cast by the Sun onto the wood is a measure of the HA. Fig. J-2. Variation in Azimuthal Rate for a Satellite Moving Uniformly in its Orbit. A1.A2 AS are azimuthal projections of the orbital points 1,2,...5 and are equally spaced in time. eccentricity and inclination of the Earth's orbit is small, the cumulative variation reaches a maximum of 16 minutes in November. To provide more uniform time than the real Sun, a fictitious mean Sun, which moves along the equator at a constant rate equal to the average annual rate of the Sun, has been introduced. Mean solar time is defined by the HA of the mean Sun. The difference between the mean and apparent solar times is called the equation of time. Standard Time. Mean solar time is impractical for communication and transportation because it varies continuously with longitude. Therefore, the world has been divided into 24 time zones of approximately 15 deg each. Normally, these zones are centered on standard meridians which are multiples of 15 deg in longitude. The uniform time throughout each zone is referred to as Standard Time, and usually differs by an integral number of hours from the mean solar time at 0 deg longitude, or Universal Time, as discussed below. Table J-2 lists the standard meridians for time zones in the continental United States. The apparent solar time is converted to Standard Time by adding the equation of time for the date and subtracting the algebraic difference (expressed in units of time) between the observer's longitude and the standard meridian.